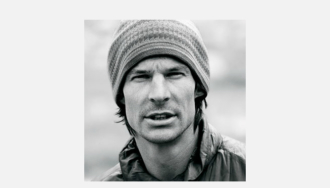 The last time Steve House called from Makalu base camp in Nepal, we heard that strong winds had kept he, Vince Anderson and Marko Prezelj from even starting up the West Face. It was a major disappointment after all the team went through to get to the mountain. But that’s not the end of the story. After hearing about another weather window Steve decided to try climbing the West Face solo on November 4. Today, in his final call of the trip, Steve tells us about his solo attempt and shares some final thoughts, especially how it feels to be back down at a more civilized elevation. Our thanks go out once again to Steve for taking the time to call in with his reports, and to Vince Anderson for his emails and the photo of Makalu 2. Steve, Vince and Marko would like to thank the Mugs Stump Award and the American Alpine Club for their support of the expedition, and all of you for listening. Complete coverage of the Makalu expedition can be found here: 1, 2, 3, 4, 5, 6, 7, 8, 9, 10, 11.